HANOI, Vietnam (AP) — FIFA's president has praised Russia's preparations for this summer's World Cup. Speaking to reporters during a one-day trip to Vietnam on Thursday, Giovanni Infantino said everything is ready for the world's biggest sporting event, which will kick off in June. "Preparations in Russia are very, very well on track. The stadiums are beautiful, the infrastructure was there, the airports are operational, hotels are there and I think the world will discover this summer a welcoming country, a country which wants to celebrate together with the whole world the biggest, not only sporting event, but the biggest social and sporting event in the world, which is the World Cup," he said. "We'll experience the best World Cup ever this summer in Russia." Infantino said the world soccer body will meet next month to decide whether video-assisted refereeing will be part of the laws of the game after almost 1,000 successful tests. "But I'm very confident and positive because I think in 2018 we cannot anymore afford that everyone in the stadium and everyone in front of TV screens can see within a few minutes on its phone whether the referee has made a big mistake or not and the only one who cannot see is the referee. So if we can help the referee, then we should do it," he said. 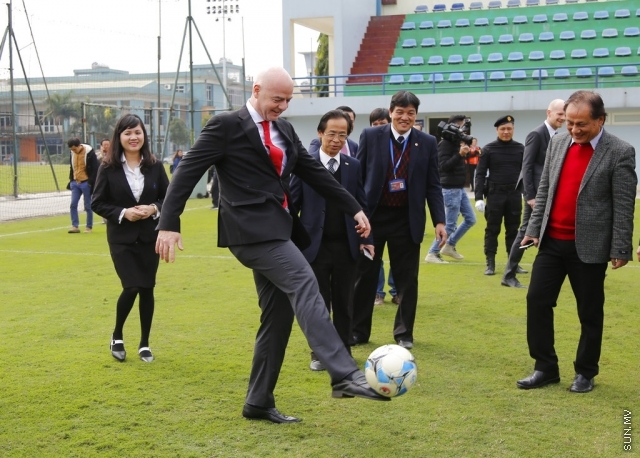 Earlier, Infantino met with Prime Minister Nguyen Xuan Phuc to discuss how FIFA can further assist Vietnam in developing its soccer through financial and technical support. Soccer is the most popular sport in the country of 95 million people which is 112th in the FIFA ranking and No. 1 in Southeast Asia. Last month, members of the Vietnam U23 team were given a rock-star welcome after they finished runners up to Uzbekistan in the Asian Football Confederation U23 Championship in China. It was the country's best soccer finish to date in Asia-wide competition, although the national team won the Southeast Asian championship 10 years ago.